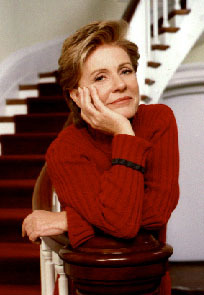 Patty Duke is known to generations as the preternaturally perky identical cousins on The Patty Duke Show. She has played both Helen Keller and Anne Sullivan in 1962 and 1979 film adaptations of The Miracle Worker. She remains a familiar presence on television, and has made more "Lifetime Channel" movies than any other actor. Duke was born into a troubled family, with parents who had vicious, violent arguments. Her father, an alcoholic, seemed to her to always be smiling, but when she was six her mother kicked him out, and he disappeared from her life. Duke's mother, who suffered from depression and had violent episodes, began working at odd jobs to support her three children. When her brother Raymond became interested in acting, a couple who managed young actors asked him if he knew of a young girl who could play the part of his sister. Duke was a natural for the part, and the managers quickly lost interest in Ray and began to concentrate exclusively on Anna. These managers were Ethel and John Ross. They took Duke into their home, and Ethel Ross told her, "Anna Marie is dead. You're Patty now". As "Patty Duke", she got small parts in television commercials and soap operas, but her charm and willingness to please soon got her larger roles. Her first screen appearance was a brief role in The Goddess (1958). Her first substantial film role was as David Niven and Mitzi Gaynor's daughter in Happy Anniversary. John Ross heard about the Broadway play The Miracle Worker almost a year before it was cast, and began blindfolding Duke to get her ready for the audition. When she got the role, she became the youngest actress at that time to have her name above a Broadway marquee, co-starring Anne Bancroft. The Miracle Worker ran almost two years on Broadway, and Duke was rarely allowed to see her natural parents. At about this time, Duke appeared on The $64,000 Question and won $32,000, but she had been coached behind the scenes. There was a Senate investigation into the "quiz show" scandals, and she was told to convince the senators that she had not cheated. She thought she had succeeded, but as she was about to step down from the platform, she was asked if she was sure she had told the truth. The 12-year-old girl broke down in tears. She then told the senators that she had been given answers for the show, and went home fearful that the Rosses would send her to reform school. The Rosses did not send their meal ticket away, but when Duke was about 13, they began using alcohol and powerful anti-psychotic drugs to control her behavior. She worked as their unpaid maid and cook, in addition to being the breadwinner, and she has said that they both molested her. When Duke and Bancroft reprised their Miracle Worker roles on screen, 16-year-old Duke became the youngest actress at that time to win a full-sized Oscar (previously, child actors had been given miniatures of the statue). Duke had asked the Rosses if her mother could attend the ceremony, but they would not allow it. In 1963, Duke was offered her own Patty Duke Show, but the concept had not yet been developed. After a few meetings with pulp novelist Sidney Sheldon, he "jokingly but with some conviction pronounced me 'schizoid'". Sheldon then devised the concept, and Duke played dual roles as 16-year-old lookalike cousins: the plucky, irascible, chatty Patty and the quiet, cerebral and thoroughly understated Cathy. As Duke later wrote, "The uniqueness of watching me act out a modestly bipolar pair of cousins when I was just beginning to suspect the nature of the actual illness swimming below the surface must have given the show some zing, because it became a huge hit". At the same time she began recording music, and a line of clothing based on her television characters was being marketed, but she thought the wardrobe was terrible. After three seasons, the show came to an end, and the now-adult Duke was distressed and infuriated to learn that the Rosses had nearly emptied her bank account of the million-plus dollars she had earned. She moved into her own apartment, but was uncomfortable living alone, and quickly married a much older man, Harry Falk, who had directed some episodes of her show. Of this period of her life, Duke has said she was emotionally out of control and attempted suicide, and her husband Falk had her committed at least once. Duke lobbied for and landed the role of Neely O'Hara in 1967's risqu� Valley of the Dolls, with Sharon Tate and Barbara Parkins. Her character, a sweet young singer who turned into a drunken virago with success, was said to be based on Judy Garland. The movie was a critical failure and Duke got especially awful reviews. Unable to deal with his young wife's drinking, psychological issues, and a rumored eating disorder, Falk divorced Duke after four years. At 24, she began dating teen heartthrob Desi Arnaz, Jr., who was 17, and the media followed their every move. His mother, Lucille Ball, commanded young Arnaz to stop seeing Duke and he obediently complied. At about that time, Duke began dating John Astin, an actor 16 years her senior, who played Gomez on The Addams Family. She became pregnant, but Astin was married and returned to his wife, and in what may have been a depressive episode, Duke married Michael Tell, a man who had sublet her apartment. Thirteen days later their marriage was annulled, and the media avidly speculated that Duke was pregnant with Arnaz' or Astin's love child. When Astin did eventually divorce his wife, he married Duke and formally adopted this child, who grew up to be actor Sean Astin. After many years wondering, their curious son underwent DNA testing in 1994, which revealed that Tell was his father. During the 1970s and 80s, Duke worked often in television movies and miniseries. She served as President of the Screen Actors Guild from 1985-88. She played the first female president in a short-lived series, Hail To the Chief, with That Girl's Ted Bessell as First Gentleman. And in 1999, she reprised her Patty Duke Show roles as identical menopausal cousins in Still Rockin' in Brooklyn Heights. In 1982, Duke was diagnosed as manic-depressive, and she has said that after a couple of weeks on lithium, she felt normal for the first time in her life. In 1987, she published her autobiography, Call Me Anna, and became the first celebrity to go public about the illness. She has since been active in mental health issues, and co-wrote a second book called A Brilliant Madness: Living with Manic Depressive Illness. She played herself in a 1990 TV movie of Call Me Anna. She has said that during one of her manic episodes, she believed that the White House had been taken over in a coup, and that only she could help. She says she took the red-eye to Washington, and called the White House. They were very pleasant to her and told her that everything was under control. Now married to firefighter Michael Pearce, Duke still works frequently on television. Politically, she was an outspoken supporter of the ill-fated Equal Rights Amendment, and supports AIDS issues and nuclear disarmament. Sepsis, after suffering a ruptured intestine.